When it comes to playing our favourite casino games, we all have many different things we enjoy. At Lucky Nugget Casino we offer it all, from the roulette wheel to the poker table to the slots, and much more. With such variety comes such excitement. Gambling can provide you with hours of entertainment, the unpredictability, the anticipation of waiting for each hand and the highs it can give you – that’s what makes it so popular to the public, including sports stars. Yes, even some of the most recognisable characters and faces from your TV screen will have an interest in gambling, from sports betting to the casino. Here we will look at some of the biggest names in the sports industry who have enjoyed their gambling. Unfortunately, when we look at sports stars and gambling, we have to start on a negative footing. John Daly, the charismatic and well-known golfer had a well-documented affiliation with gambling and it ultimately ended up costing him in excess of $50m. Daly is a larger than life character that possessed undoubted ability on the golf course. As well as many high profile wins on the tour, the American was also a two-time major winner in the 90’s and became one of the most recognisable men in the sport, with his blond locks, extravagant behaviour and excellent skills. It led to him becoming something of a fans favourite, and although he did divide opinion, particularly in the golfing world, his huge personality certainly made him appeal to the common man. However, that also led to several personal issues involving alcohol and his health, and he also spent a lot of time at the casino. His stories go down in history, including the one time he won $750,000 at a golf event before flying straight to Las Vegas and lost $1.65m in five hours. His favourite tipple was the blackjack table and Daly could be seen in many of the highest profile casinos across the world, particularly the strip in Sin City where all the high rollers would frequent. Clearly Daly didn’t know his limits and it ended up costing him a lot of money, but despite that he will always maintain he has no regrets, and actually looks back on that time with some fondness because of all the fun he had whilst doing it. That’s the spirit, John! For sports stars, betting on sports can be difficult for many reasons including rules and regulations that stop you altogether. 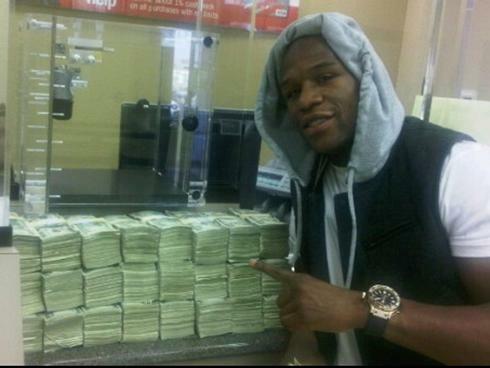 However, one man who loves to flaunt his wealth and share his sports knowledge is Floyd ‘Money’ Mayweather. The undefeated boxer is someone who certainly appreciates his own publicity and is never too shy to show off his ridiculous bankroll when it comes to betting. He is regularly showing off his big wins on social media, usually with high stakes betting on the NBA and the NFL. He is clearly well into his sports, watching and betting on his favourite teams regularly and with all that money in the bank, who can blame him. After spending the best part of his life training and avoiding being punched in the head we think Money Mayweather, whatever you think of him, deserves to enjoy himself now he has retired. Anyway, as well as the huge sports bets, Mayweather has also been spotted in Las Vegas, of course, and he posted a picture of himself enjoying the casino while in preparation for the biggest fight of his career – against Manny Pacquiao. Not bad preparation, eh. When it comes to any sport, not many people have the impact this man had. 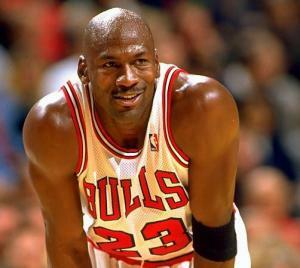 Michael Jordan will go down as one of the greatest players of all time and the number 23 will be synonymous with the great man and has even been retired at his team the Chicago Bulls and even Miami Heat, despite the fact he didn’t play for them! Not bad. However, when he wasn’t tearing it up on the court and being the MVP as his side would win the NBA finals, he could often be found at the poker tables – even before a big game! Controversy surrounding MJ and gambling reached a peak in 1993. In the middle of a big playoff run for the Bulls’, Jordan was spotted hitting the tables in Atlantic City the night before a crucial game against the New York Knicks. It was in 1993 that MJ admitted that he had to cover gambling losses of $57,000 that were predominantly built up from the poker table. However, stories of Jordan and gambling would never truly go away and in 2007 at the NBA All-Star weekend, Adam Jones, the cornerback for the Cincinnati Bengals alleged that the 6x NBA winner lost $5m in one night playing craps! However, for a guy worth over $1bn even that would be loose change. To many, Charles Barkley is the NBA analyst that successfully pulls apart the tactical insight of the big NBA games alongside some of the big stars. However, like MJ, Barkley was a brilliant player in the 80s and 90s and another who enjoyed a rather extravagant lifestyle off the pitch, that included gambling. The former Philly player reckons he has lost over $10m of his fortune due to his love of the tables and was regularly spotted rolling the dice and hitting the cards during his playing career. The worst of it came when he was playing blackjack and suffered a huge $2.5m in just six hours of intense play. Yet, Barkley doesn’t just recall the tough times when it comes to gambling, he mentions a $700,000 windfall from playing the same game while in Vegas. 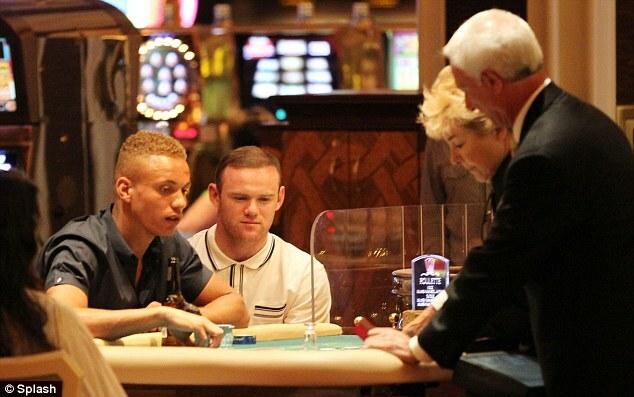 Yep, even some of the biggest names in the world of football spend time at the casino, including England captain Wayne Rooney. The Manchester United forward has long been the golden boy of English football and had every move scrutinised by the intense media that comes with the territory of being the country’s highest profile player. However, the start of Rooney’s gambling stories come in 2006, where a £700,000 debt was resolved after talks with the footballer, his agent and the bookmaker. It was believed that he accrued the debt from betting on football, horses and the dogs. Yet, around the same time rumours surfaced of a young Rooney losing £65,000 at a local Manchester casino in just two hours. It was believed he went in and staked the maximum £500 a go on the blackjack and roulette tables and clearly his luck wasn’t in. Since then, the United hero has also been spotted drinking beer and playing craps in Vegas with some of his team-mates during his holidays. A good way to spend your downtime, we say! So there you have it, like everyone, sports stars will also enjoy the casino and the entertainment that it provides and because they are well-known and generally have more disposable income it will make the headlines. From every sport, you have players who will enjoy the slots or the roulette and this is just a sample of some of the sports stars who have had their gambling details aired in public. If you want to experience the same thrill, head over to Lucky Nugget Casino, but bet sensibly and use your head. Good luck!